Teacake in England is a light yeast-based sweet bun containing dried fruit, typically served toasted and buttered. In the U.S. teacakes can be cookies or small cakes. In Sweden they are sweetened wheat soda breads served with butter, jam and often cheese. In India and Australia a teacake is more like a sponge cake. Tea refers to the popular beverage which these baked goods are an accompaniment to. In most of England, a teacake is a light, sweet, yeast-based bun containing dried fruits, most usually currants, sultanas or peel. It is typically split, toasted, buttered, and served with tea. It is flat and circular, with a smooth brown upper surface and a somewhat lighter underside. 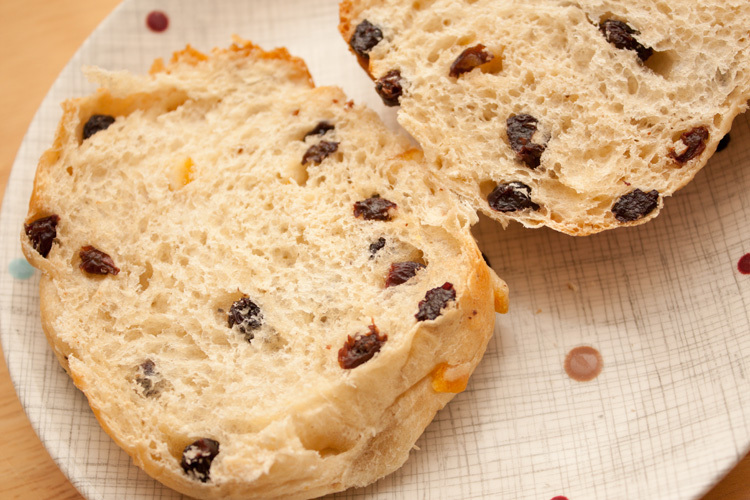 Although most people refer to a teacake as a cake containing fruit, in East Lancashire, certain areas of Yorkshire and Cumbria the name currant teacake is used to distinguish fruited 'cakes' from plain bread rolls. In West Yorkshire, a large plain white or brown teacake 9 inches or 225 mm diameter is often also called a breadcake and is used to make very large sandwiches. Many cafes sell these for breakfast or midmorning snacks. In Kent, the teacake is known as a "huffkin", which is often flavoured with hops, especially at the time of harvesting hops in September. In Sussex, a luxurious version of the teacake with added aromatics such as nutmeg, cinnamon and rose water is still sometimes made and called a manchet or Lady Arundel's Manchet. In East Lancashire, the former West Riding of Yorkshire and elsewhere in the North like the town of Barnsley, a teacake is a round bread roll which is cut in half to make sandwiches. They do not usually contain any sort of dried fruit. They can be made with either white, brown, wholemeal, or Granary flour (a brand of flour produced by Hovis, made by malting wheat, crushing the grains, roasting them, and then mixing them with brown flour). A favourite way to eat them is to slice them into fingers, toast and then spread with butter and Bovril or Marmite. In Sweden, the word for teacake (tekaka) refers to a sweetened wheat soda bread, resembling a farl and served warm with butter and jam. It is often served with cheese as well. In the Southeastern United States, a teacake is a traditional dense large cookie, made with sugar, butter, eggs, flour, milk, and flavoring. In the rest of the United States, a teacake is a single-layer lightly spiced spice cake (often made with buttermilk) topped with powdered sugar and often also lightly glazed on top. It may contain fruits such as apricots, blueberries, or cranberries. In Australia and India, a teacake is typically a heavier sponge cake. A quick and easy cake to make, typically ready to serve warm from the oven in less than 30 minutes. Ingredients usually consist of always available ingredients in the kitchen cupboard and they are typically flour, eggs, butter, cinnamon and sugar. It is traditionally served warm as an accompaniment to tea. Australian teacakes are sprinkled with cinnamon and fine (caster) sugar, and are usually served warm from the oven. Indian recipes avoid cinnamon.